My husband always complains that we don't have any pictures on our walls. I hate to admit that this is all too true. It's not that I can't find artwork to put up. I have a basement filled with gig posters, framed and ready to hang, but left leaning against the walls. (That's not entirely my fault though. I'm short and tend to hang pictures low and crooked. At least I did the framing!) So most of the walls in my house remain empty, waiting for inspiration to strike. The dining room is the only exception. 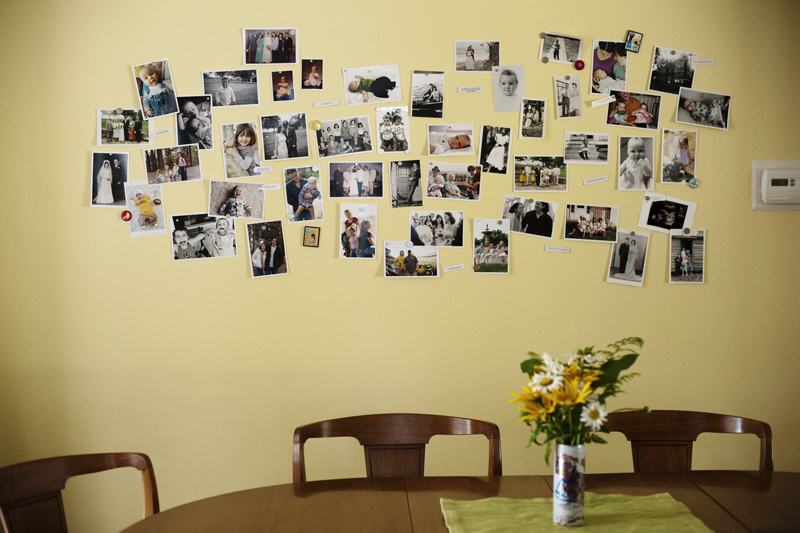 I had a plan for the big, blank wall in our dining room before we even moved into the house. I was inspired by a photo of children's artwork hanging on a dining room wall. As a kid we used to hang our artwork in the kitchen with tape. 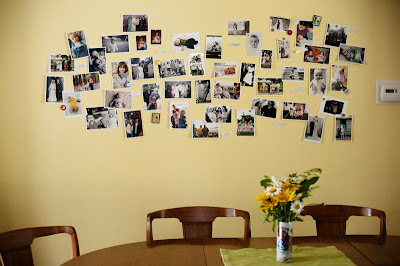 I wanted a place where my kids could do the same, and although tape worked fine on the wallpapered walls of my childhood home, it doesn't stick well to painted walls, and I really didn't want a wall filled with tack holes! Instead I chose to make a magnetic wall. The dining room needed to be repainted anyway, so I bought a can of magnetic primer and covered the wall with it. It took about three coats of yellow paint (one more than recommended) to cover the black primer, so I have to use super strong magnets to hold everything up. For now I have up a mix of old and new family photos in color and black & white. Pictures of our parents and grandparents when they were young, wedding photos, baby photos, informal family portraits, at least one photo of each of our nieces and nephews, pictures from our own childhoods, and a few favorites of Abe. I also included some good fortunes (saved from fortune cookies and mounted on a strip of magnetic tape they make fun magnets, although not strong enough to hold photos on the wall). It's nice looking up there and seeing our grandparents (most of whom have passed away), parents, siblings, nieces & nephews (most of whom live far away), and our own little family. I'm sure someday Abe and his artwork will cover the wall, but for now it's a tribute to everyone we love, and a reminder that "family is more valuable than money."